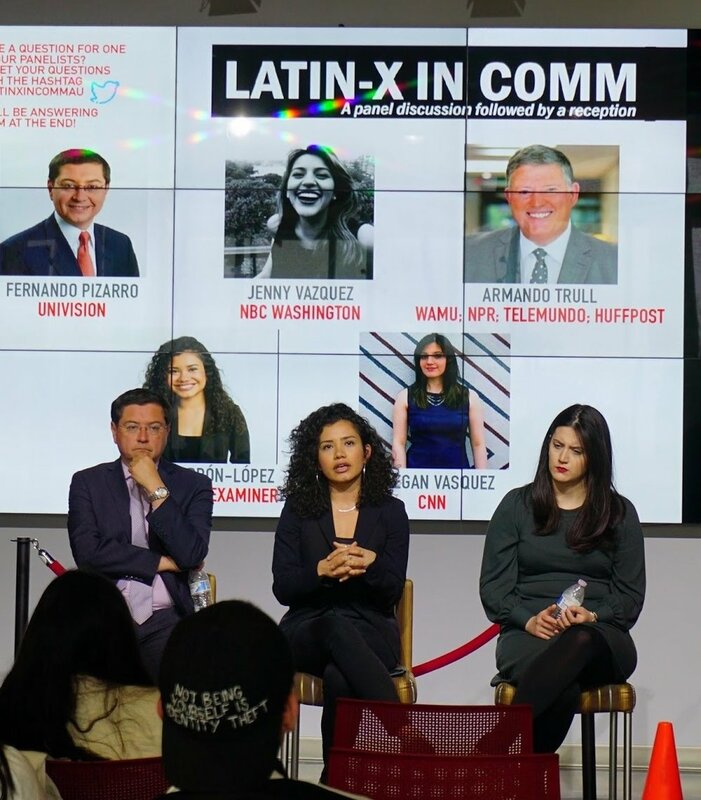 The Latinx & American Student Organization (LASO) and AU’s School of Communications collaborated in an effort to host a discussion panel and networking session with some of the most prominent Latinx names in the communications field. The panel comprised of five well-known journalists: Armando Trull, Fernando Pizarro, Laura Barrón Lopez, Maegan Vazquez and Jenny Vasquez. All of these LatinX individuals have had experience in major news outlets, such as NBC, CNN, NPR and Univision. The event was moderated and organized by undergraduate student and Blackprint editor Mariah Espada. “I had the idea of organizing this event after having a moment in my professional career where I felt not only empowered as a journalist, but as a Latinx woman. I wanted other POC students to feel that same excitement which is often difficult to feel as a minority in an industry like communications,” Mariah stated. The audience was made up mostly of POC students. Espada concentrated the conversation around Latinx identities in the workplace, as the panelists gave the audience valuable advice on such topics. The panelists also talked about how the Latinx community within the journalism field of work supported one another. The group talked of “Cafecitas con Congress,” meet ups which invited Latinx journalists in the District to cover stories that were being covered by other Latinx journalist from different news outlets. The panelists said Latinx workers in the media field utilize networking to further increase their professional spheres. “Being a journalist has become more of a political act,” Laura Barrón Lopez, journalist of the Washington Examiner, said. All the journalists on the panel agreed with this statement as they advised the audience that in current times, the passion for writing about topics of interest should not fade away due to the politics mixed in with journalism. The event ended with a pleasant reception that included networking opportunities for the students, as well as the appearance of backpack journalist Bill Gentile who announced the creation of an NAHJ (National Association of Hispanic Journalist) chapter here at American University. Espada was ecstatic by the turnout and connections made by POC students at AU with the panelists. “It's safe to say that after hearing from our panelists during the event, dreams really do come true!” she said.